The entrance exam for IIFT 2019 has been conducted successfully at all the test centers. The result for IIFT entrance exam 2019 has been announced on January 15, 2019. The admission of candidates in the MBA (International Business) programme for the academic session 2019 is done on the basis of the candidate’s performance in the written examination. The further selected candidates will then be eligible to appear for the Essay write-up, Group Discussion, and Interview. The Group Discussion and Interview to be held between the 04th week of January and middle of February. There are 200 seats in IIFT Kolkata and 220 seats in IIFT Delhi for MBA IB programme. Get here complete details of IIFT 2019 MBA Exam from here. Latest: The result of IIFT 2019 has been announced. Click on the “Result” link below in the quick links to check it. Note important dates and events of IIFT 2019 exam which is being held for MBA IB admissions. The exam analysis for IIFT MBA IB 2019 has been released. With the help of the exam analysis, the candidates will get to know the most difficult section, what is the good score in each section, any major surprises, if there is any, expected cut off, etc. 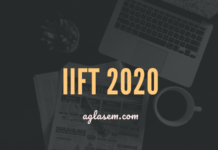 The candidates can check the major highlights of the IIFT 2019 exam below. The Quant Section was the most difficult. There were 05 Passages in the Reading Comprehension section, out of which 3 were easy and two were long, but yet it was a doable section. Logical Reasoning had a mixed response of the candidates. Some students said that it was Easy while others commented that it was as difficult as Quant. General Awareness had Normal questions and was of Moderate difficulty level. The exam conducting body will release the IIFT Answer Key and Question Paper for Set A, B, C, D. However, before the official answer key, the candidates will get the Unofficial Answer Key for IIFT 2019 which is going to be released by various coaching institutes soon. The candidates can use the answer key and question to cross-check their answers and on the basis of that, they can calculate their probable score. Now, remember that the probable score obtain with the help of the IIFT Answer Key 2019 may not be same as the result, but at least this will give you a rough idea om what is your status on qualifying the test. To qualify the written examiantion of IIFT 2019, the candidates need to obtain minimum cut off marks in each section. The Institute has mentioned that there will be a section cut off, which means, only those candidates can qualify for the next stage of the admission who will secure marks above the sectional cut off. The cut off for IIFT 2019 is not yet available, however, the candidates can refer to the expected cut off which has been prepared on the basis of the exam analysis. Recognized Bachelor’s Degree of minimum 3 years duration in any discipline with 50% marks in Graduation (45% for SC/ST/PWD candidates). Candidates appearing in final year of Graduation can also apply subject to submission of proof of requisite qualification by 7th October 2019. Recognized Bachelor’s degree of minimum 3 years’ duration with minimum 50% marks. 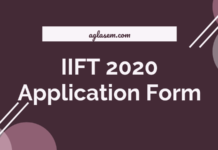 IIFT 2019 application form is available online. Check eligibility criteria before applying. Click Application form for Full Time MBA(IB) 2019-21 link. Scroll down on this page which is titled “Admissions 2019 – Admission to MBA(IB) 2019-21 at New Delhi, Kolkata, Kakinada (Andhra Pradesh)”. Download information brochure and read it. Click Apply Online link. Click apply now link on left side of page. There are three links on IIFT 2019 registration page: For general candidates, For SC / ST / PwD / OBC NCL candidates, For Foreign Nationals / NRI candidates. Select one that suits as per eligibility and proceed. Fill online application form, upload documents, and pay application fee. IIFT 2019 syllabus indicates topics from which questions will be asked in entrance exam, which are as follows. Preparation for IIFT entrance exam can go simultaneously with other that for other MBA entrance exams. Books for IIFT 2019 entrance exams can be referred to practice past year paper questions. Grade A by NAAC with CGPA score of 3.53. Ranked 23rd by NIRF in 2018. Super League 1 in Best B-School Ranking 2017 by Business Standard. A+++ which is highest B-School rating by Business Management Chronicle 2016. Number 2 in Top Government B-Schools of India by GHRDC CSR B School Survey 2016. Top 10 bussiness school In India. Ranked 6 under best Government Universities in India by India Today in 2018. IIFT offers several programs including PhD, Diploma, Certificate. MBA in International Business at IIFT Delhi and Kolkata are flagship programs. Institute holds entrance exam for MBA IB admissions on yearly basis. More than 62,000 students apply for it. Placements at institute are 100%. 4 Students of IIFT were offered US$150,000 p.a. packages in 2016-18 batch. Campus of Indian Institute of Foreign Trade in Delhi is in Qutab Institutional Area. It is built over an area of 6.5 acres. It became functional in 2006 in East Kolkata. Area covered by Kolkata IIFT campus is 7 acres. Government of Andhra Pradesh has given a land of 25 acres to IIFT. Campus will be similar to that in Delhi and Kolkata. IIFT will function on rented premises in Kakinada subject to approval of UGC. Placement Cell of IIFT guides and assists two year full time MBA IB students to secure good jobs. Several alumni hold reputed positions in top companies in world. 4 Students got US$150,000 p.a. plus salary package. 7 Students gotUS$80,000 p.a. plus salary package. The average compensation offered to the IIFT students this year went as high as 19.23 LPA per annum, with the domestic average standing at 18.27 LPA. A total of 31 students were placed in International Business roles. Highest international salary package is US$ 1.5 LPA. Highest domestic salary package is INR 29 LPA. More than 20 International offers were made. 93 Pre Placement Offers were made. MBA (International Business) is a six trimester general management programme with a focus on International Business for developing a competent cadre of business executives to meet the country’s growing requirements for trained personnel in the field of International Business Management. Developments in the international market on the one hand and the consequential impact of the same on India’s domestic market on the other, call for an increasingly professional approach and sensitivity to international business environment. Annual tuition fee: Rs 8,35,000 which can be paid in three instalments. Other charges: Rs 32,500 for first year, Rs 22,500 for second year. SC, ST, PwD students get 50% concession on tuition fee. Foreign/NRI: Will pay tuition fee with other charges in single instalment. Fee is US$ 30,000 per year, and other charges of Rs 32,500 for first year and Rs 22,500 for second year. There will be questions on English Grammar, Vocabulary and Comprehension, General Knowledge & Current Affairs, Logical Reasoning, Data Interpretation and Quantitative Analysis in IIFT 2019 MBA IB entrance exam. Anything more on this such as number of questions from each section and so on can only be discerned from past year papers. An analysis of past year IIFT exam pattern is given below. There was negative marking of one-third of mark allotted to that question for incorrect answers. Components of IIFT 2019 MBA IB admission: Written Test, Group Discussion, Writing Skills Assessment and Interview. IIFT will hold entrance exam on December 02, 2018. It will be a 2 hour written exam in 20 cities in India. Indian Institute of Foreign Trade will fix cutoff in written exam to select students for Writing Skills Assessment, Group Discussion and Interview. Writing Skills Assessment, Group Discussion and Interview will be held in January / February 2019 at Ahmedabad, Bangalore, Chennai, Delhi, Hyderabad, Kolkata, Lucknow and Mumbai. Students who opt for Allahabad, Bhubaneshwar, Chandigarh, Coimbatore, Dehradun, Guwahati, Indore, Jaipur, Jamshedpur, Kochi, Nagpur and Visakhapatnam as centres for written test need to select one of the above-specified centres for Writing Skills Assessment, GD and Interview. Candidates can able to download the admit card from the official website. On the scheduled date, IIFT shall upload admit cards of applicants which they can download by logging in. Open soft copy of IIFT 2019 admit card and print it on a plain white sheet of paper. Read instructions in it and adhere to them. Reach exam center by 9 AM on the day of the exam with one of following documents. Decided by the Indian Institute of Foreign Trade, cut offs will be announced after result. Check here the IIFT Cut Off of past year for each section and minimum marks category wise. The candidates who have cleared all the sectional cut offs and obtained minimum marks are shortlisted for the second round of selection process. Minimum marks overall is as given below category wise. IIFT offers several programs. A list of them is given below. Two-year MBA (International Business) at New Delhi and Kolkata. Two-year MBA (International Business) at Dar-es-Salaam (Tanzania). Executive Post Graduate Diploma in Finance at New Delhi. Certificate Programme in Export Import Management: On campus and Hybrid. For more details, candidates can download Information Brochure.